The Lake Havasu Area Chamber Ambassadors held a ribbon cutting ceremony for Bridge Lake Dental, celebrating the opening of its new Lake Havasu location and Chamber membership. 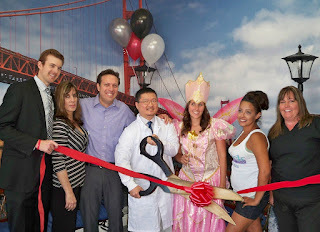 Attending the ribbon cutting from left to right were Ryan Heroy; Chief Operating Officer, Lauresa Henderson; Office Manager, Paul Romero; Director of Concept and Resource, Dr Johnathan Pak, Morgan Figley; Dental Hygienist, Bri; Radio Host for the Knack; and Brandy Howey; Dental Assistant. Bridge Lake Dental uses the latest and best in materials and techniques to ensure long lasting preventive dental health. For more information contact them at 928-399-7711.